Our product range includes a wide range of hunter douglas metal louvers and metal sun louvers. Keeping in mind the diversified requirements of our clients, we are affianced in offering premium grade range of Hunter Douglas Louvers in varied specifications. These louvers are uniquely designed and manufactured with utmost precision at our vendors’ end. Owing to the durable finish standards, our louvers are widely appreciated amongst clients sitting all across the country. Besides, clients can avail these unmarked quality louvers at nominal prices. Application: Open facade systems are typically specified on larger building projects, such as offices or public utility buildings. They are chosen as an effective sun control solution or as a ventilating envelope to visually divide open spaces. With enormous years of industry experience, we have emerged as the leading trader of premium quality Metal Sun Louvers that are frames with horizontal and vertical slats. Precisely manufactured using high quality raw metal and advanced techniques at our vendors’ manufacturing unit. 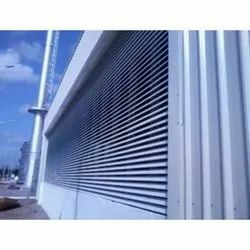 We are renowned for our procured louvers that are greatly used in building construction industry. Also, customers can avail this louver from us at rock bottom prices.